Political leaders in the Northeast have very different ideas about how to treat coastal properties ravaged by Hurricane Sandy. Some aim to reduce development along exposed coasts while others say let’s rebuild. How they proceed could set important precedents for managing rising flood risk along the nation’s coasts. Motivated by concerns about more frequent and intense extreme weather, New York Gov. Andrew Cuomo plans to buy back damaged coastal properties from homeowners willing to sell and preserve the land as undeveloped public spaces. Cuomo’s plan would use funds from the Federal Emergency Management Agency (FEMA), which requires that purchased properties not be developed. Meanwhile, New York City Mayor Michael Bloomberg and New Jersey Gov. Chris Christie are going in another direction, favoring options that are more likely to keep homes and residents in place, rather than encourage movement away from the shore. Although Mayor Bloomberg has been outspoken about the serious threats posed by extreme weather and climate change, he has proposed a buy-back initiative that would allow future development on purchased properties. His plan would draw on funds from the Department of Housing and Urban Development, which doesn’t make the same stipulations as FEMA about future development. As reported by WNYC, Bloomberg and his staff contend that future development could be done safely and that the option for re-development may be attractive for areas with high property values. Meanwhile, Gov. Christie is encouraging coastal communities to rebuild, offering $10,000 to residents to remain in and repair their homes. It’s unclear how communities and individuals will factor in future risk as they rebuild. In January, Gov. Christie endorsed the adoption of revised FEMA flood plain maps for coastal New Jersey. But he backed off his initial endorsement in March, claiming the revised maps are too aggressive in reclassifying properties into higher risk categories. He believes they will be revised again, with fewer properties categorized as high-risk. Decisions on these matters will be important. Although not final, FEMA’s Advisory Base Flood Elevations maps can indicate how homeowners should consider rebuilding, and how these decisions might affect their insurance premiums. Elevating homes can cost tens of thousands of dollars, while premiums can increase by as much as a factor of 10 for changes in the risk categorization. Even properties that are not remapped into a different flood hazard zone could see significant premium increases. The recent flood insurance reauthorization bill, passed in 2012, raises the cap on annual premium increases from 10 percent to 20 percent, giving FEMA greater flexibility to adjust rates as risks change. These issues are hardly confined to the areas struck by Sandy. Coastal populations across the United States continue to grow — by nearly 35 million people between 1970 and 2010. 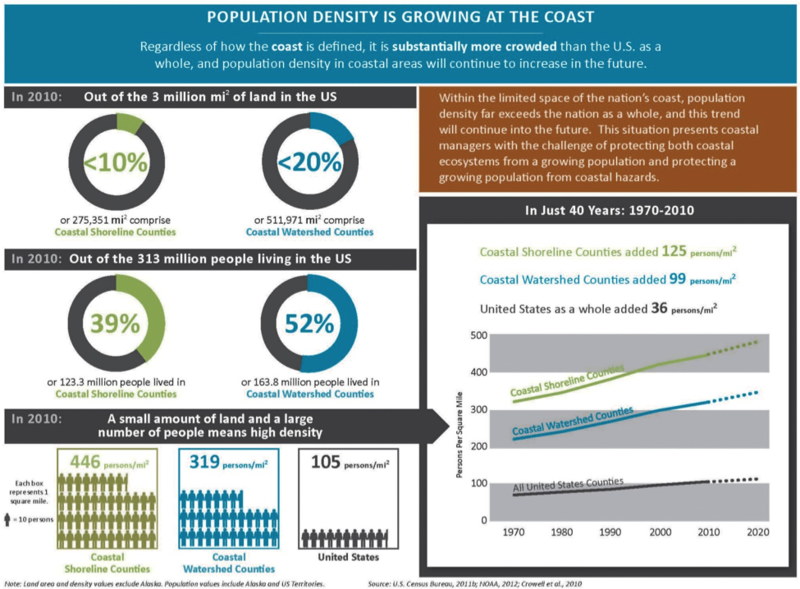 Coastal shoreline counties account for nearly 40 percent of the country’s total population, and tend to be more densely packed than most inland areas. These trends, combined with projections for rising sea levels and more intense storms, ensure that many families and businesses will continue to be at risk. Barring substantial changes in our land use and infrastructure, future hurricanes, winter storms, and especially high tides (sometimes called king tides) will cause significant damage. How New York and New Jersey balance the desire to restore damaged coastal communities with the obligation to prevent future disasters may set important precedents for how the rest of the country manages risks arising from coastal flooding, and more generally, extreme weather events.